Shlom-Tzion (139–67 BCE), more commonly known by her Hellenized name Salome Alexandra, has the distinction of being the only true, independent Jewish Queen of Israel in history. 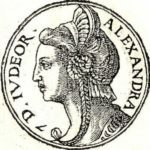 Her husband was the king Alexander Yannai, a Sadducee who sparked a civil war and began an extermination campaign against traditional Judaism. At his death, Salome took over and restored peace to the kingdom. She ended her husband’s cruel persecutions of the rabbis (recalling many of them from exile in Egypt, including her brother, the great Shimon ben Shetach). She also re-established the Sanhedrin, the Jewish Supreme Court. Together with the sages of the day, a public school system was instituted for all children, rich or poor. Salome also championed the rights of women and developed the marriage document (ketuba) with clauses that protect the bride, as we still use to this day. Greatly expanding the army and fortifying Judea’s borders, Salome protected the kingdom from foreign powers (particularly Armenia and Syria). Her reign was marked by incredible prosperity, and the Talmud recounts that during her nine-year rule the rains always came in their times, oats grew as large as olives and wheat grains as large as kidney beans. Sadly, the kingdom quickly unraveled at her death, and was shortly after conquered by Rome. This entry was posted in Law, Politics & Military, Religious Leaders and tagged Armenia, Hellenism, Israel, Jewish Kingdom, Judea, Ketuba, Marriage, Pharisee, Prosperity, Queen, Rome, Sadducee, Sanhedrin, Shavuot, Syria, Talmud, Yeshiva on May 23, 2012 by Jew of the Week.